Preheat broiler to 450°F (230°C). In a small bowl combine mustard and orange marmalade. Set aside. Heat the olive oil in a nonstick skillet over medium-high heat. Add salmon and cook for about 2 to 3 minutes on each side, until golden (if it the salmon has the skin on, cook skin side first). 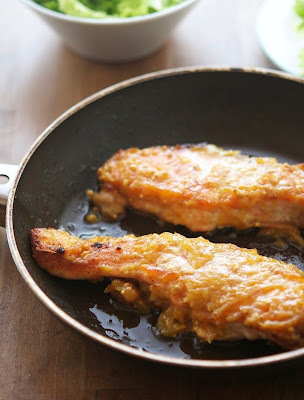 Turn off the heat and brush fillets with orange-mustard mixture. Transfer the skillet from the stovetop to the oven and broil for 5 minutes until the top is golden brown and perfectly caramelized. If your salmon had the skin on, gently peel it off before serving (it should come off very easily).